1- Burj Dubai is the tallest skyscraper in the world, standing more that 800 meters tall. 2- US President Obama has read every Harry Potter book and collects Spider-Man and Conan the Barbarian comics. 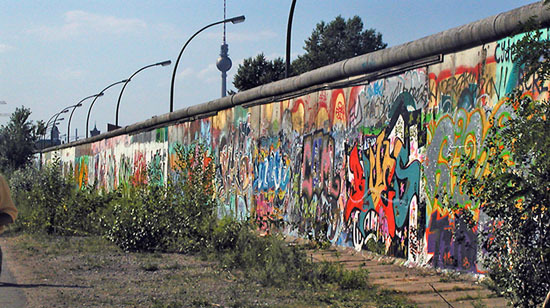 3- The destruction of the Berlin Wall (right) began when private citizens began to demolish entire sections of the Wall without interference from government officials on November 9, 1989. 4- The tongue is the only muscle in the human body that is attached at only one end. 5- Natural gas does not have any odor. In order to detect a gas leak, some gas companies add a chemical that smells similar like rotten eggs. 6- There are mirrors on the moon. Astronauts left them so that laser beams could be bounced off of them from Earth. These beams help give us the distance to the moon give or take a few meters. 7- The average day is actually 23 hours, 56 minutes and 4.09 seconds (23.934 hours). We have a leap year every four years to make up for this shortfall.